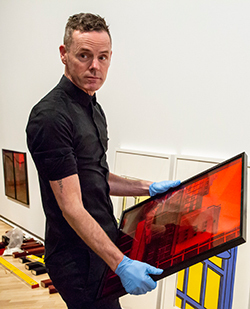 In his current role as Senior Curator of Photography at the National Gallery of Australia, Shaune is responsible for the collection of international and Australian photomedia. The role involves building the collection, developing exhibitions, and managing relationships with key stakeholders both externally (artists, collectors, supporters) and internally within the gallery itself. The role gives him an opportunity, which he greatly respects and appreciates, to have an impact on the development of the national collection, as well as to make it accessible to a wide range of people. He sees it as "a rare privilege" to handle items of such significance on a regular basis. Reflecting on his Doctor of Philosophy (Arts) studies, Shaune highlights the opportunity his candidature gave him to develop and define "a set of questions which provide a framework for making sense of visual material and making it accessible." He says "the experience of writing my PhD got me jobs, but most importantly, it gave me this framework." Shaune also credits the teaching he did throughout his Doctor of Philosophy (Arts) for preparing him to make his passion for the field accessible and available to others. He talks of "the amazing conversations with students which were transformative" - conversations in which he had to critically interrogate the subject matter in a way that helped him clarify what he could bring to the field and how best to communicate that. Following his Doctor of Philosophy (Arts), Shaune came to the National Gallery of Australia to work on projects. He then spent two years working on a history of Australian war photography for the Australian War Memorial, analysing the role of photography in accounting for the experience of conflict. His PhD was critical to the success of this work as it gave him the skills to deal with both social history and the close analysis of pictures. Shaune remained at the War Memorial for several years as Senior Curator, after which he was appointed Director of a metropolitan art gallery. He then moved to his current role.